If the diameter of the circle is , what is the area of the shaded region? 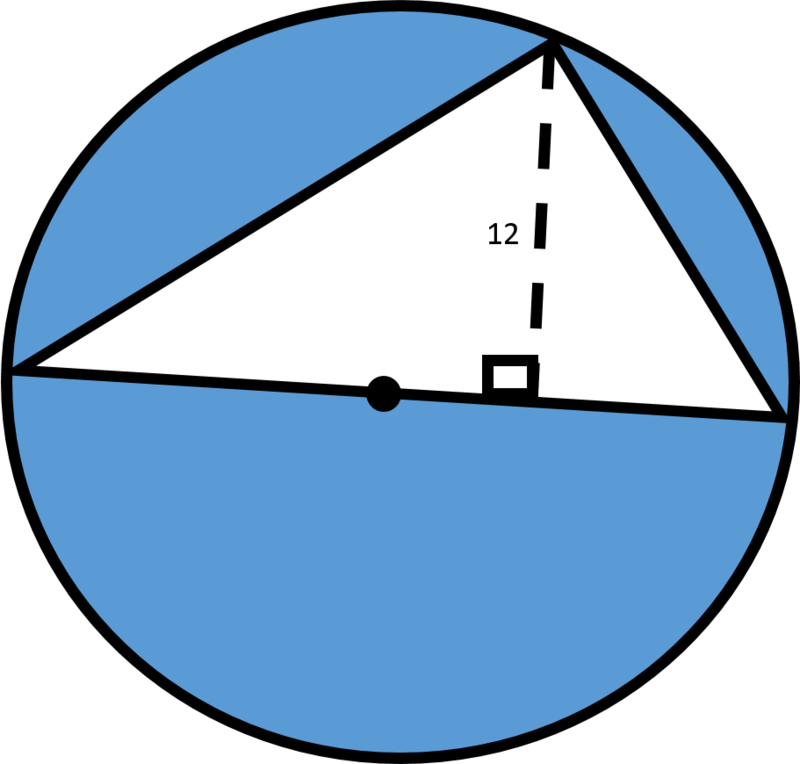 From the given figure, you should notice that the base of the triangle is the same as the diameter of the circle. In order to find the area of the shaded region, we will first need to find the area of the circle and the area of the triangle. Now recall the relationship between the radius and the diameter. Plug in the value of the diameter to find the value of the radius. Now, plug in the value of the radius in to find the area of the circle. Next, recall how to find the area of a triangle. The height is already given by the question, and remember that the base is the same as the diameter of the circle. Plug in these values to find the area of the triangle. We are now ready to find the area of the shaded region. Remember to round to decimal places. A circle has a radius of . What is the area of the circle? So the area of the circle is . The circumference of a circle is . What is the area of the circle? There is not enough information given. In order to find this circle's area, we need to find it's radius, . We are not given the radius, but we are given the circumference, which can be used to find the radius. Therefore, the area of the circle is . 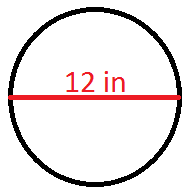 If this circle has a diameter of 12 inches, what is its area? To find the area, we need to determine the radius of the circle first. The radius is calculated as , where D is the diameter. Given that the diameter is 12 inches, the radius is , or . Next, we know that the formula for the area of the circle is . Michael broke his clock, so he decides to make a new one. He wants the new clock to have a diameter of 16 inches. What will be the area of the new clock? If the diameter is 16 inches, the radius is 8 inches. Now, just plug the radius into the equation to find the area of a circle. A large pizza at Hogie's Pizza and Subs has a diameter of and is cut into equal-sized slices. If slices of pizza are eaten by a group of friends, what is the area of the remaining pie? Round to the nearest tenth of an inch. If an diameter frozen pizza is cut into equal sized slices, what would be the area of one slice of pizza? If the circumference of a circle is , what is the area? Now to find the area we can plug this radius into the formula . University of Michigan-Ann Arbor, Bachelor in Arts, English Language and Literature. Howard University, PHD, Law. Northern Illinois University, Bachelor of Science, Operations Management. Oral Roberts University, Bachelor of Science, Mathematics. City College of NY, Master of Arts, Mathematics Education.